I know that all wood is not the same. It doesn’t react the same way to stains or finishes, however, I didn’t expect this. Wow. What do I do now? If you look at the last meme post, you can see that my two newest designs have a bit more color on them than in the above picture. I applied a coat of tung oil to my squares of jatoba, and it darkened the wood enough to obscure my lighter shades of stain! I’m not sure how to fix this. 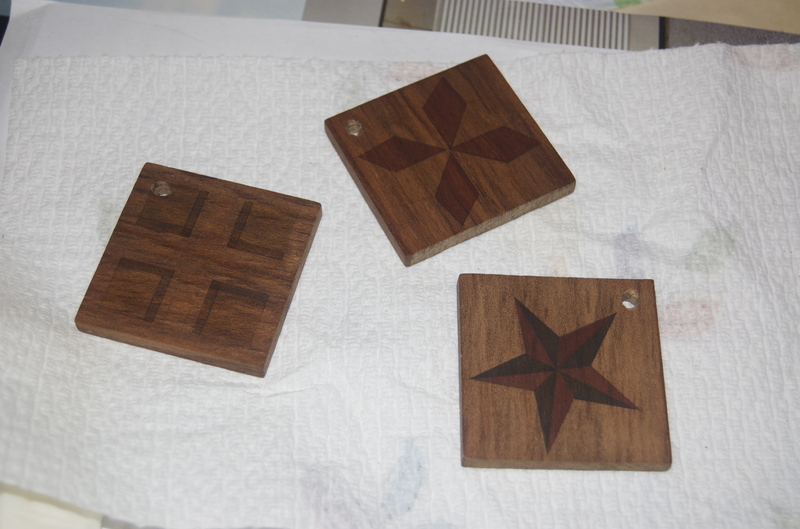 I’m going to try to sand them down a bit and re-apply a different stain. I’ve never tried to stain over tung oil, and am not convinced this will work. Keep your fingers crossed for me! I’ve, finally, started work on the last two items in my meme project. Or should I say back to work on the meme? One is the center from the blazing star pattern used on the drum, and the other is me playing with lines and the patterns they make. Here’s a look at what I’ve been doing. You are currently browsing the Stained Woods: Art by Tina Hanagan, Bloomington, IN weblog archives for September 2009.